Structural engineers have been inspecting a hotel that was devastated by a fire. The blaze at the Royal Clarence Hotel, described as England's oldest hotel, started at 05:00 BST on Friday and continues to burn. The facade of the building has partially collapsed and its interior walls have been reduced to rubble. Firefighters extinguished the flames but said they were still dealing with some "hotspots". The shell of the building is being monitored with lasers to detect movement, while a thermal imaging camera is helping to show the internal temperature of debris. Gerald Taylor, from Devon & Somerset Fire Service, said: "Any decision on demolition will be discussed with the fire service, police and local authorities." "While the public may not be able to see flames, we are still actively fighting the fires that are burning under the debris," he added. "We're keeping our eye on one hotspot which has climbed from 30 degrees to 140 degrees in the last couple of hours." 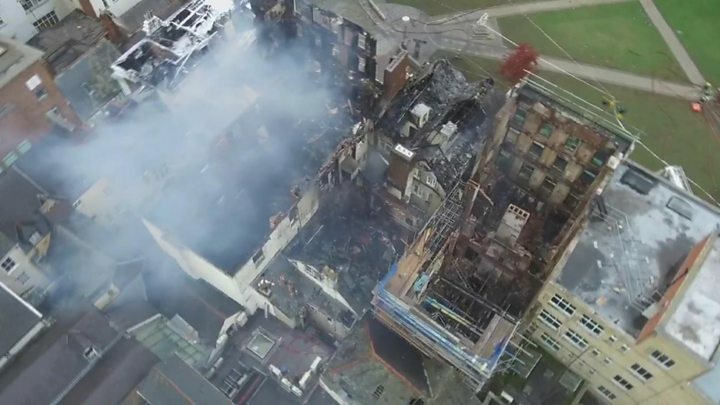 A senior source within the fire service told the BBC that demolition work could begin as soon as Monday, but would be more likely to take place on Tuesday. 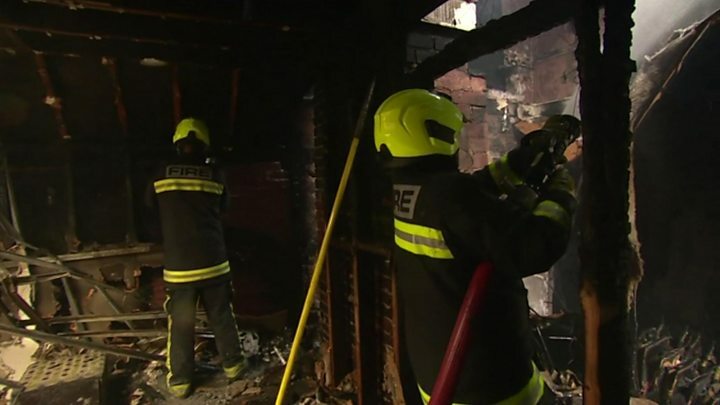 The Bishop of Exeter, Robert Atwell, praised the "heroic" firefighters for saving the city's Norman cathedral, and said he wanted to see the fascia of the Royal Clarence rebuilt. "All the historic stuff inside has gone, you can't replace it, but I hope and pray that they rebuild the frontage as it was, because it deserves to be there, because that's what will preserve at least the veneer of the architectural continuity on the Cathedral Green." The fire broke out above the Castle Fine Art gallery where renovation work was under way, before spreading to the Well House Tavern, a cafe and the hotel. Guests at the Royal Clarence were evacuated from their rooms in the middle of the night to another hotel nearby. There were no reported casualties. 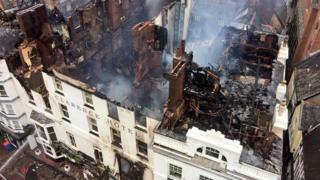 A spokesman for the fire service said the gallery and hotel had been destroyed by the blaze, but its cause was unknown. Fire crews used water from the River Exe hundreds of metres away to help tackle the flames. About 80 firefighters remain at the scene. Work continues on the ground to damp down hotspots, but fire crews are now moving to the next phase of this operation. Firefighters must stop water getting onto the facade of the hotel in case it collapses and structural engineers will assess what will happen when demolition teams move in tomorrow. Some local shops remain closed and the High Street has not fully reopened. Holy Communion at Exeter Cathedral was moved to the smaller Chapter House. Normally up to 400 worshipers attend. Today there was seating for just 100. People have been sharing their memories of the hotel on social media. Clare said on Twitter: "So sad to see the devastated Royal Clarence Hotel, lovely memories of birthday lunch with my husband in the wonderful Abode". Others are already discussing what should happen to the site of the hotel once it has been cleared. On BBC Breakfast's Facebook page, Matt said he hoped the facade could be saved, while Lizzie added "I hope they don't put something modern there instead".